At Spa Tranquila we offer an unparalleled standard of perfection and professionalism in both aesthetic treatments and guest services. Our spa features a serene ambience along with a wide selection of the most advanced Laser, Skin and Body treatments. Indulge yourself, or bring a friend and enjoy our menu of individual services and spa packages. Our signature beauty and wellness treatments are designed for men, women, couples and groups. Spa Tranquila is known for the best in aesthetic treatments and spa relaxation. We are pleased to introduce the latest in anti aging treatments, including laser hair removal and microdermabrasion. Our highly qualified team of specialists believe that the ultimate spa experience is all about perfection and professionalism. Come live and work in the beautiful Okanagan Valley; the wine capital of B.C. Spa Tranquila (an Oasis for Laser, Skin & Body Care) is currently hiring professional body workers to join the growing team. Our team consists of Medical Estheticians, Estheticians, Make-Up artists and Body Workers. We are seeking team members who have a positive client-focused manner and a strong desire to develop their career within a growing company. Spa Tranquila has been established for the past 10 years and has been voted the number one day spa in the South Okanagan on countless occasions. If you already have clientele in place and wish to join our highly educated & dynamic team, we look forward to meeting you. We offer an above average compensation package with exceptional tips. The beautiful Okanagan boasts adventure at your door including hiking, kayaking and skiing adventures as well as wine tours and lazy afternoons at the beach. Please submit your resume (with cover letter) to [email protected] (Attn: Andrea Boyle) or call 250-490-0985. Spa Tranquila is known for the best in aesthetic treatments and spa relaxation. Our highly qualified team of specialists believes that the ultimate spa experience is all about perfection and professionalism. Angela recently moved to the beautiful Okanagan from Victoria, B.C. In her spare time she enjoys gardening, hanging out with her dog and rabbits, or you can find her in the kitchen baking up a storm. Jessica graduated from the Okanagan College in 2012, she was born and raised in the beautiful sunny Penticton. Her areas of expertise are her facials and waxing services; she is your go to girl to get the perfect eyebrows! Jessica loves seeing people recognize their natural beauty and is so grateful to be of help. In Jessica's spare time you will find her outdoors in nature; camping, biking and snowboarding. Born and raised in B.C. and world traveler, Caitlin is our newest esthetician. Since graduating from the Okanagan Cosmetology Institute, Caitlin's major focuses have become eyelash extensions and advanced skincare. Ashley recently graduated from the Okanagan Cosmetology Institute with a Diploma in Esthetics. She was born and raised in Penticton and she enjoys exploring our beautiful city while spending as much time as possible outdoors! Barbara has over 20 years of experience working with clients in spa, wellness center and private practice settings. She offers aroma therapeutic massage and specializes in subtle body techniques such as lymphatic drainage therapy, energy work and chakra re balancing. 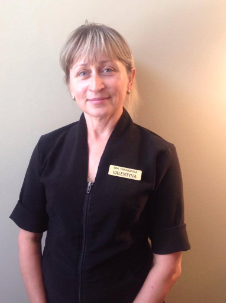 Valentyna is originally from the Ukraine were she was a Biology & Chemistry teacher, since moving to Canada her knowledge of the human body inspired Valentyna to undertake training at the Kelowna University of Massage. With more than seven years experience as a therapist, she has learned that client education is paramount to promoting wellness and pain relief for her clients. Valentyna is trained in Aikido and in her free time she enjoys gardening, swimming and loving life.